The PS4 component seems to run fine for a couple of days, then it logs this message a couple of times every minute. Any idea how to avoid and fix this? Unfortunately not. I’ve focussed on other thing last few weeks, so i’ll give it a try soon. Keep you posted! I am adding the art work manually now, by adding a .jpg picture of a game to the www/games folder in hassio. Works fine for now, automatic art work would be great. Can you turn on or off the Playstation when you see this error message ? I have encountered the same issue too. In my case, my router is to blame : my Raspberry Pi can’t discover the PS4. Using the ssh interface, the Raspberry pi couldn’t ping the PS4. I had to manually add an ARP entry in the Raspberry pi, and it fixed the issue. Can you post a semaple of how you do the local file for the img? Does anyone know if there is a way to automatically login with a defined user ? With this custom component, my PS4 turns on but waits on the user selection on the login screen. Is there a way to bypass that ? I don’t need to do that when I manually turn on my PS4 or use the PS4 second screen app. Thanks for your answer, but my PS4 is already configured to automatically sign me in (only user) when the system is switched on. As said in my previous post, it does sign me in when I manually power on the PS4, or use the PS4 second screen app to turn it on. However, when I use the HomeAssistant component, the system turns on but it asks me to press the “PS” button of the remote, and then choose the user. 40 commits changed 14 files with 766 additions and 0 deletions. This custom_component is broken in 0.88. 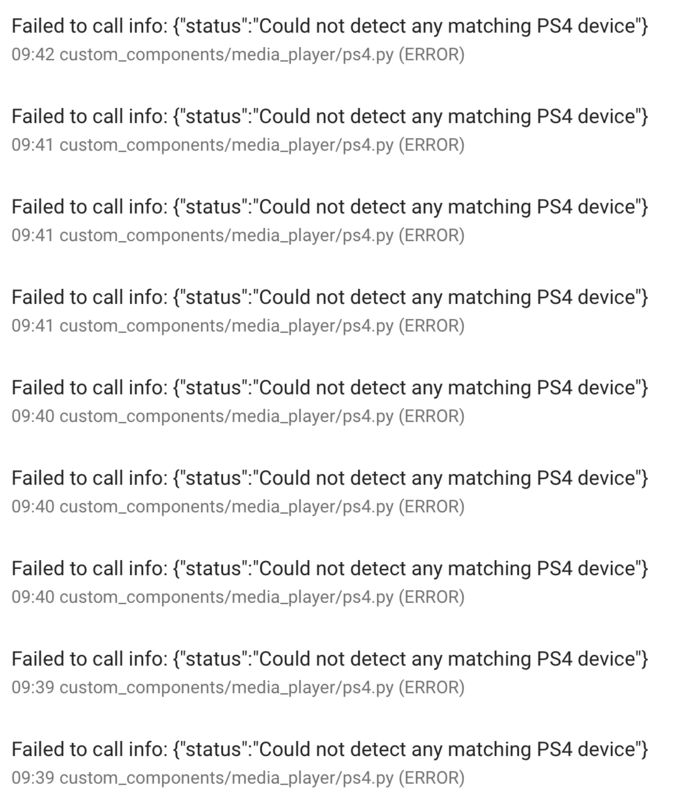 """Playstation 4 media_player using ps4-waker.""" 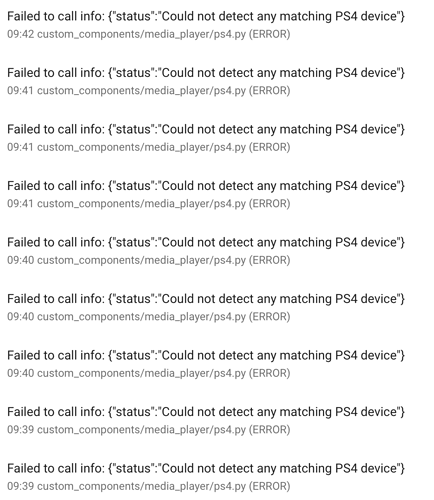 I updated the custom component with the latest ps4.py file but now I get the following error when I do a config check. Any idea where this is coming from? WARNING:homeassistant.helpers.config_validation:Your configuration contains extra keys that the platform does not support. I’m getting the same warning. thank you for this, the edit in your post solved it for me as well! Will this component come with 0.89? It should!! I’m going on the podcast after experimenting with the beta that comes out this week, to discuss it so I hope so! Will this remove the need to have node and ps4waker installed? If “yes”, my excitement for this will double! Yes, as far as I understand from following the pull request. This is awesome. I love the Home Assistant community. I search to see if a component is available for PS4 and I find out that it will probably be in the next release of Home Assistant!